Former Swindon manager Paolo Di Canio has dismissed as "distortion" reports that he used force to remove several items from his old office. CCTV cameras filmed Di Canio returning to the County Ground early on Thursday, three days after his resignation. It was reported that the club had to take security measures at the ground as a result. "This is a complete distortion of what actually happened," Di Canio said in a statement released to BBC Sport. "I decided that I would clear my office of my own personal items at a time when no one else was there." Di Canio acknowledged a "small amount of damage" caused in the process of removing the items, but added that his former assistant Fabrizio Piccareta had offered to pay for it. Piccareta took charge of the team for Tuesday's 3-1 victory at Tranmere, but then also resigned immediately afterwards. Di Canio's statement continued: "I attended the County Ground with some of my technical staff who were still employees of the club and entered into my office to remove my personal items, including some pictures that I had asked the club to produce personally for me. "These pictures documented the time when I signed for the club and our first pre-season and were personal to me. "There was no force used in anything we did and the following day, Fabrizio Piccareta, along with some of my technical staff, went into the club to advise them of what we had done, offering to pay for the small amount of damage. "In addition to this, there were a number of items that fans had left for signature, which were signed and given to the club." 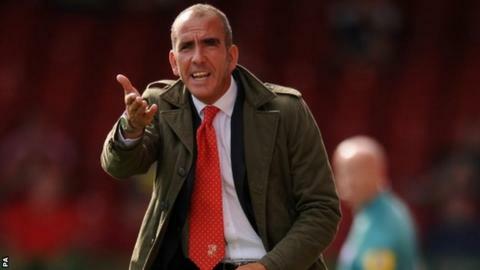 Di Canio also refuted comments made by Swindon's former owner Andrew Black on the social networking site Twitter on Thursday following the completion of the club's sale to a local consortium. Black claimed Di Canio was "uncompromising and does not manage upwards" and that he "saw himself as bigger than the club", but the Italian said that the comments did not "accurately describe what actually occurred and is a misleading version of events, which in the fullness of time, I will prove." He added: "For the moment I can make no further comment on this, as this matter is now in the hands of my legal advisers."